The natural way to aid a good night's sleep. Enjoy hot or cold. It's the taste of the good life. 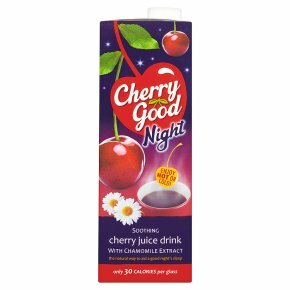 Only 30 calories per glass.Relax and unwind with Cherry Good Night What's the secret of a good nights sleep? Chamomile's daisy like flowers have long been valued for their calming properties. Along with B Vitamins which can help the normal functioning of the nervous system, this delicious blend is the perfect night cap! And that's not all, added Vitamin C really packs a punch - it will also help the normal function of your immune system, collagen formation (great for healthy skin, nails and teeth!) and protection of cells from antioxidant stress. All this going on whilst you are dreaming! Restorative sleep is such an important part of our health - leaving you feeling refreshed and energised for the day ahead. To further help your body unwind from a busy day - remember to turn off any over stimulating backlit computer screens or the TV - let your eyes and brain relax!, indulge in a warm bath and avoid caffeine and alcohol. Pour yourself a glass of the good stuff We call it... the mellow juice Bursting with flavour, Cherry Good's amazing taste comes straight from the delicious juice of pure cherries we cram into every carton. Our herbal infusion of Chamomile and Multivitamins enables this blend to help you Relax and Unwind, and aids a restful night's sleep, so that you awaken refreshed and ready to grab life by the cherries!